The Drop is a quietly intense and riveting crime drama that takes hold of you with its authenticity, its creative camera work, its surprisingly nuanced characters and the performances that bring those characters to life. For actors Tom Hardy and the late James Gandolfini, it’s precisely the kind of consummate, committed work audiences have come to expect when they take on serious roles. If you’re a fan of either actor’s work, it’s a must-see film experience, and if you’re not, then you will be by the time the credits roll. Hardy (Lawless, The Dark Knight Rises) plays Bob Saginowski, the quiet, unassuming man slinging beers at “Cousin Marv’s”, a neighborhood hole-in-the-wall bar in Brooklyn. He works with and is related to the man whose name is above the door, Marv (Gandolfini), but it’s been years since Marv owned the bar. These days the real owners are Chechen mobsters who use the bar along with a dozen or more others in the city as “drop bars” — places to hide money collected nefariously for later collection. For Bob, running the bar for and taking orders from the Chechens is just the way things are now, and there’s nothing to be done about it. He works the bar, takes the nondescript envelopes wrapped in a folded newspaper brought in from time to time by grim-faced toughs, drops them in a hole under a bar mat behind the bar, and goes back to pouring beer or shots for the locals, all with the same solemn, somewhat hangdog facial expression. He walks home every night, and goes to mass at the local Catholic church every morning at 8, even on Saturdays, sitting in the same pew by himself every time, and never taking communion when it’s offered. That’s his life, its been his life for years, and he’s okay with it. That is, of course, until two seemingly unrelated events happen within a day of one another and begin to set big changes in motion. The first comes while on that walk home one night, when he hears a sorrowful canine whining coming from a trash can in front of his neighbor’s house. He finds a beaten and bloodied pit bull puppy in the trash, and that find brings him in contact with Nadia (Noomi Rapace, Prometheus, Sherlock Holmes: A Game of Shadows), whose trash can the puppy was left in and who knows a lot more about caring for a dog than he does. The second event seems at first much more ominous and threatening: Cousin Marv’s gets robbed at gunpoint, and suddenly Bob and Marv are on the hook with the Chechens for the $5,000 the gunmen took. “Find my money,” says Chovka (Michael Aronov), the mob boss’s son and chief enforcer, after showing Bob and Marv a small and completely unnecessary example of what happens to people who try to cross him and his organization. But finding and returning the money turns out to be just the beginning of their woes, as a shady figure from Nadia’s past returns to darken her door and Bob’s, and cagey police detective Torres (John Ortiz), investigating the original robbery, starts to uncover secrets long kept by Bob, Marv, and everyone in the neighborhood that calls Cousin Marv’s their home away from home. 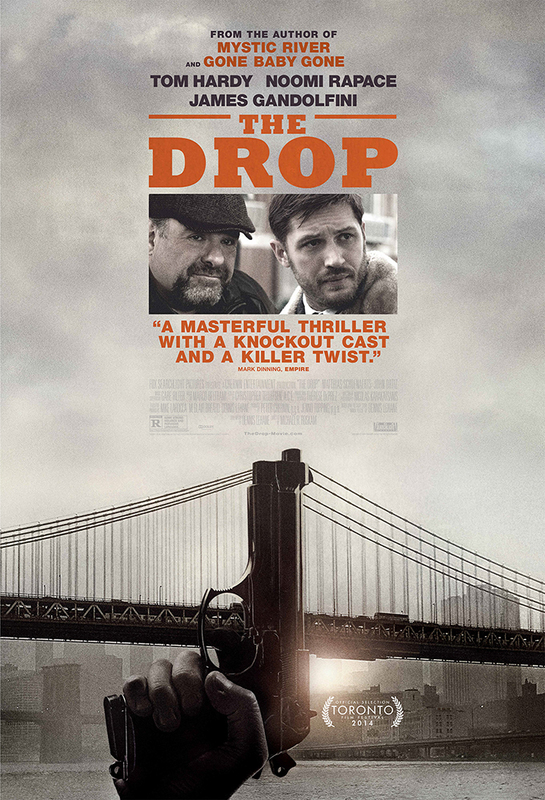 The Drop is the first screenplay from novelist Dennis Lehane, the author of Shutter Island, Mystic River, and Gone Baby Gone. Lehane adapted his own short story “Animal Rescue” into the screenplay for the film, and so The Drop has the feel and the pacing of a short story — very focused on a short span of time and a small set of characters. Belgian film director Michaël R. Roskam, whose 2011 film Bullhead was nominated for a Best Foreign Language Film Oscar, seems to understand the need for the setting of this film — the well-worn facades, dimly-lit street corners, countless dive bars and brick row houses that comprise the many disparate parts of Brooklyn’s lesser-known blue collar neighborhoods — to be as much a character in the film as the actors themselves, and he brings that character to life with a rich tapestry of colors, plays of shadow and light, and the occasional unorthodox camera angle or shot. It’s a gorgeous film to look at, even if the environs themselves aren’t the prettiest or most photogenic. As good as the camera work and directing are at bringing the setting to life, it’s the actors placed in that setting that carry the day here, starting with Tom Hardy. Hardy is among the very best working in Hollywood today at physically transforming himself in order to carry out a role to its maximum effectiveness. In The Drop, he shuffles from scene to scene, shoulders hunched up by his ears, head bowed, somewhat reminiscent of Billy Bob Thornton’s Karl Childers in Sling Blade, with a vacant expression in his eyes and face that suggests he’s either barely comprehending what’s happening around him or he’s simply closed off to it. He speaks his lines and at times narrates the action in a version of Brooklyn-ese that’s entirely distinct from his native British accent, and that along with the boyish haircut and his jaw hidden behind a scruffy beard makes his turn as Bob about as different as humanly possible from just about any character we’ve seen him inhabit in feature films. What audiences see in the film working in conjunction with the film’s main plot is Bob’s awakening and re-connection with his world through meeting Nadia and coming to care for the puppy, who he names Rocco, after St. Rocco, the Catholic patron saint of dogs. It’s nothing short of captivating what he does here, and its because his characterization is so captivating that the film’s climactic final act works as well as it does. Bob may sound like a bore to watch tool around for 106 minutes, but there is a payoff for your patience here, and it’s a doozy. As for Gandolfini, it’s for portraying the sort of prideful, flawed and emotionally broken man that Marv is that perhaps he’ll be best remembered for outside of anything having to do with Tony Soprano. Like Hardy’s, his is a quietly effective turn here, with only occasional flashes of the ferocity we know some of his more famous characters for making itself felt in sharp sidelong glares and rueful remarks made to those who stoke Marv’s long-held-onto rage and indignation. Marv’s inability to let go of what was, or what he believed to be what was, is as important a catalyst for the story we get in The Drop as any other plot beat. Every scene played out between Marv and Bob is full of emotional undercurrents and tension borne of years of perceived slights and resentment left unspoken between the two men, brought to life by two terrific actors at the top of their respective games. What results will stick in your memory as much as anything else you may have seen on film this year. In short, The Drop deserves your attention at the box office this weekend. It may not have been on your radar before, as most Fox Searchlight films don’t tend to get as much press and marketing attention, but make a point to look for it at your local theater while it’s around. Make no mistake: it’s one of the year’s finest, and it needs to be seen to be truly appreciated. Starring Tom Hardy, Noomi Rapace, James Gandolfini, Matthias Schoenaerts, John Ortiz. Directed by Michaël R. Roskam.